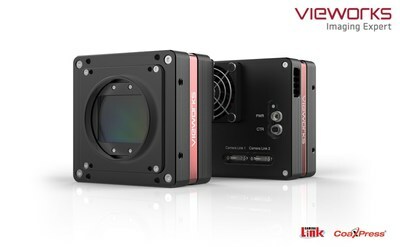 SEOUL, South Korea and CHICAGO, April 5, 2019 /PRNewswire/ -- Vieworks, a global leader in machine vision, presents the latest industrial cameras at Automate 2019 (Booth# 8440) from April 8th to 11th in Chicago. Automate, held once every two years in the United States, is the broadest automation solutions event in North America. Over 450 exhibitors will showcase the latest innovations in robotic, vision, and motion control automation technologies, to provide an overview of the entire automation industry. Vieworks VP-151M, with Sony CMOS image sensor, amazingly improves the performance and sensitivity of the camera by providing wide dynamic range. Moreover, VP-151M model enables its sensor to maintain the operating temperature at up to 15℃ below the ambient temperature, through the Thermoelectric Cooling (TEC) Peltier technology. In non-TEC cameras, the sensor temperature can increase to near 50℃, and therefore, generates worse dark noise. However, this cutting-edge technology enables VP-151M to dramatically reduce the noise and offer the unparalleled image quality. In addition to superior image quality, the camera allows stable operating condition and longtime exposure. Despite of the spectacular performance, VP-151M is also competitive in price, which makes it more accessible. Therefore, this ultra-high resolution camera is ideal for various demanding applications such as FPD, PCB and semiconductor inspections.